BLV tool (SAP CONTACT CENTER/BCM Log Viewer) is included in every SAP CONTACT CENTER releases. It provides a simple interface and easy to use search functionalities to help with SAP CONTACT CENTER log reading. BLV tool is a single executable file located in the SAP CONTACT CENTER installation package, file path: \Tools And Utilities\blv\blv.exe, so there is no actual installation executable. Please copy the blv.exe file to a convenient location (eg. desktop), and double click to execute. If you would like to add blv into the context menu in Windows Explorer, then there are several options to accomplish this. You can use the Open With / Choose Default program and choose BLV as the default viewer for certain file types, or to show up in the Open With menu. One convenient option is to have BLV shown up in the top level of the context menu, regardless of the file type. You can accomplish this with some simple steps in regedit. For example like this: c:\utils\blv "%1"
Don’t forget the double quotes! To start viewing SAP CONTACT CENTER log, simply drag a log file into the BLV window, and the log will be displayed. To view multiple log files simultaneously, you can open multiple BLV windows, and drag logs into each window. Alternatively, log files (extension .txt and .log) can be directly associated with blv.exe, so double clicking on the log files will open a new BLV window, and display the logs directly. Normal Windows navigation works in BLV tool: Up and Down arrow keys, Page up and Page down keys, Scroll bar, and mouse scroll wheel. In addition, the keyboard PgUp/PgDn (will page up and down) and Ctrl+Home/Ctrl+End will go to the start and the end of the file. For a complete list, please refer to the “Hotkeys (Keyboard and Mouse Commands and Command lines)” section. The Find Window can be involved by pressing “Ctrl+F”, where you will see the following screen. 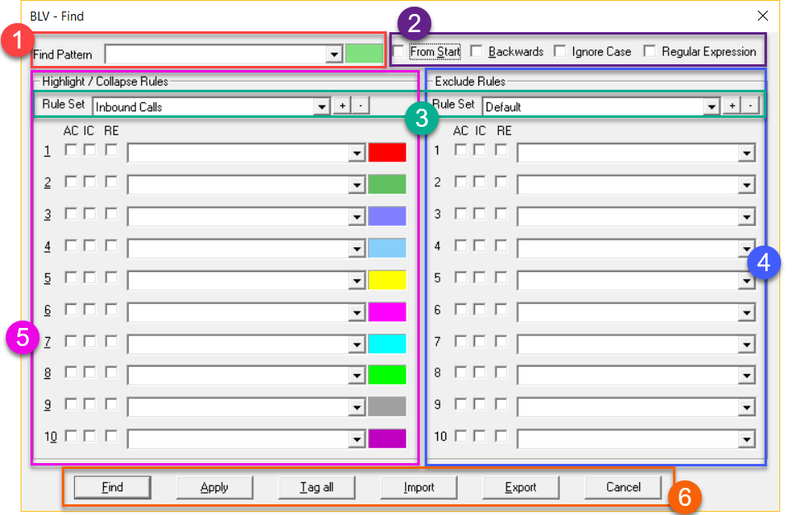 From this interface, one can set up keywords, patterns, set new rules, create/edit rule templates, export and import template as well as tag and set highlighting flags for each keyword(s) or patterns used. 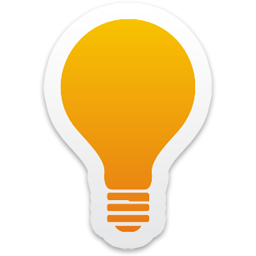 this can be used to quickly enter keywords which are automatically highlighted. You can also double-click on a text and after pressing Ctrl+F the field is filled. using the “+” create new rule (the user can also choose to copy the existing rule as a starting point). With the “-” you can delete existing rules, except the last available one. this will allow users to exclude patterns or keywords to make the trace cleaner in combination with the highlight/collapse rules. this is the starting point for the keywords/highlight rules creation. Once a template in created, use the fields therein to enter free text keywords and patterns. When the “Apply” button is pressed, the template is then saved. Here as well as under the exclude rule section, the user can choose to select what should be highlighted and what ignore (AC/IC/RE). Input the desired keyword(s) into the text area on the left hand side; enable option Highlight and Ignore case, then press Find. The keyword will be highlighted in the log. 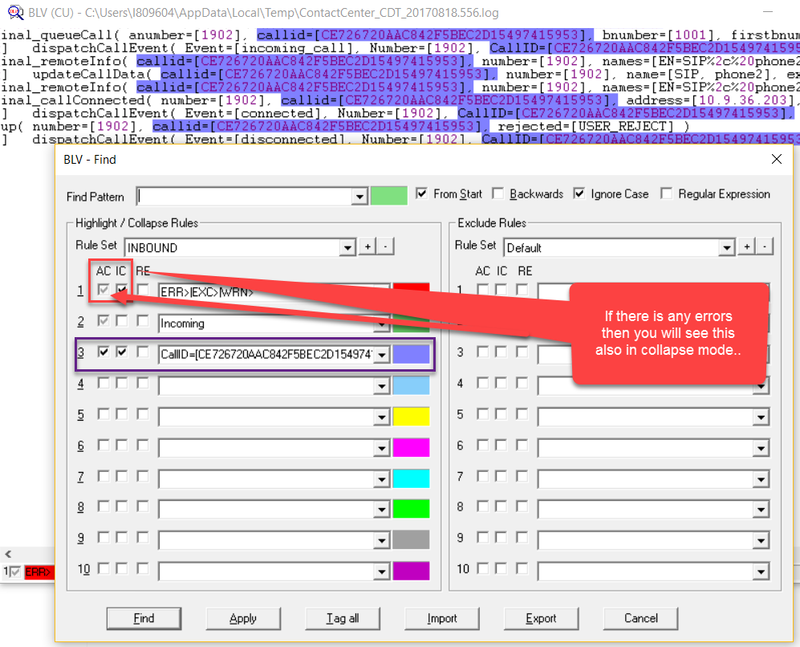 You can also setup “Exclude Rules” to narrow down the trace. The BLV tool can highlight keywords with up to 10 different colors. When highlighting more than 10 keywords, it is useful to combine similar keywords under one color, e.g.‘ERR>|error|EXC>|exception’. There is a wealth of options in both dialogs, but I think their meaning should be pretty evident. Keywords “alw>”, “wrn>”, “err>”, and “[EXC]” (all without quotation marks) can be used to quickly screen Alarm, Warning, Error, and Exception messages in the log. Set up Highlighting/collapse rules for keywords “alw>”, “wrn>”, “err>”, and “[EXC]”, then press “c” on the keyboard, the BLV tool will collapse the log to display only lines containing the keywords. Press “c” again to return to normal mode. The tool also has a live view move which can be invoked by pressing “l” (letter L) on the keyboard to view the logs in live mode. The combination IC should give live view collapsed. Another cool feature is the Time Difference View. To invoke press Ctrl+R and BLV sets the time reference to the top line and changes to a view that shows for each timestamp line the time difference to the set reference point. This is very handy when troubleshooting timing issues. 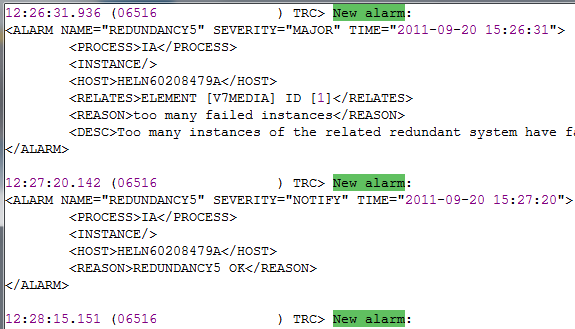 If the ‘r’ is pressed, BLV changes to a view that shows for each line the time difference to previous timestamp line. By pressing ‘g’ again, you can switch back to normal collapsed view. Press F1 in BLV window to view additional help on hotkeys. 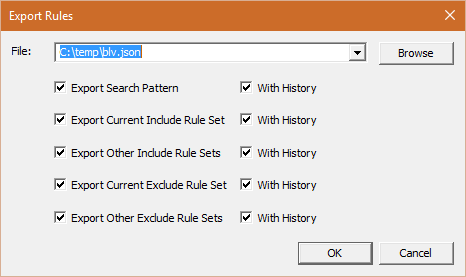 With the find option you can specify a text which BLV searches for and shows in the first specified file. 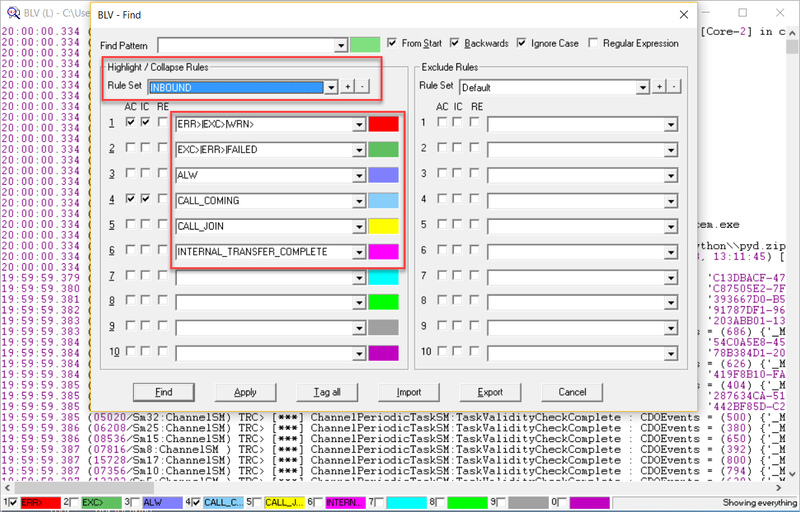 With the select option you can tell BLV to highlight right away the given text in the first specified file. With the offset option you can tell BLV to show the next given file starting from the given offset. Combine all of the options, for example, like start a search for some text from some offset and then also highlight some other text. Specify multiple files on the command line, each with their own preceding offset. When you then navigate between files (with Ctrl+PgDn and Ctrl+PgUp) in BLV, it shows each file from the respective offset. Note that BLV orders the files for navigation in alphabetical order, not in the order they are given on command line. Good instructions for a very useful tool. Try out BLV and logs will start to have a new meaning to you. Using BLV is a good way to jump start your CCtr understanding and troubleshooting skills. Yes, this tool is really handy and that’s why we highly recommend our customers get familiar with it to troubleshoot CCtr issues. But you can use it for anything not only CCtr. I plan to share another blog with log reading tips and tricks to expand on the BLV usability as well. Big thanks to Arto Keskiniva for developing the really awesome tool!! Very Very good explanation of this tool, This tool is very useful despite the size of the log that the other apps do not open.